Porsche will reduce production by 2,500 cars at its plant in Zuffenhausen. STUTTGART (Reuters) -- Daimler AG and Porsche Automobil Holding SE plan to use short working hours at plants in Germany later this year, abandoning hopes that a year-long sales swoon could reverse quickly. Despite record sales in China and a series of new models, Daimler intends to put staff on short hours again in the fourth quarter. A spokeswoman said on Thursday the company had applied for short hours at most German sites as a precautionary measure. About a quarter of Daimler's 160,000 staff in Germany are already on short hours under a scheme in which the government helps subsidize pay for affected workers as a way to avoid layoffs. Porsche said it would cut output at its main sports car plant in Zuffenhausen, near Stuttgart, for 18 days by year-end. The result will be 2,500 fewer cars. 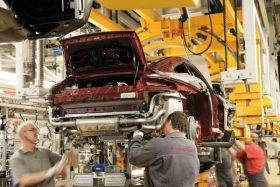 The head of the IG Metall labor union said on Wednesday that he expected carmakers such as Volkswagen AG to use short hours in response to the end of the government's 2,500 euro ($3,571) subsidy for motorists who scrap old cars and buy new ones. Volkswagen said it has no plans to expand short hour schemes. Mercedes rival BMW, the world's biggest premium car maker, said it would end short hours at one plant in September and October and plans for subsequent months were not yet set.